Lithograph of the Pagoda at Eden Gardens in Calcutta by Vincent Robert Alfred Brooks (1814-85) one of 'Eight views of Calcutta' published in London c.1870. Eden Gardens are situated at the northern end of the Maidan. They were laid out in 1834 and named after Emily and Fanny Eden, the sisters to Lord Auckland. Auckland was the Governor-General of India from 1836-1842. In 1840, Eden Gardens were formally opened to the public and for many years they were a fashionable evening meeting-place in Calcutta. The gardens are also home to the Calcutta Cricket Club. 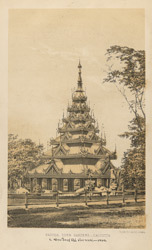 The Pagoda, seen in this view, was brought from Prome in Burma by Lord Dalhousie and erected in the gardens in 1854.